The Hampton Bay Commercial Grade Sterling Acrylic Top 42 -inch Square Dining Table in Brown features an all-weather rust-resistant Aluminum Base and a hard, durable and translucent acrylic top. The table is easy to clean and weather resistant. You can coordinate this dining table with the Sterling Collection Dining Chairs for a complete set. You can add other Sterling collection pieces to complete your patio area. The Hampton Bay Commercial Grade Sterling Slatted Top 48 -inch Round Dining Table in White features an all-weather rust-resistant Aluminum Frame. The table is easy to clean and weather resistant. You can coordinate this dining table with the Sterling Collection Dining Chairs for a complete set. You can add other Sterling collection pieces to complete your patio area. 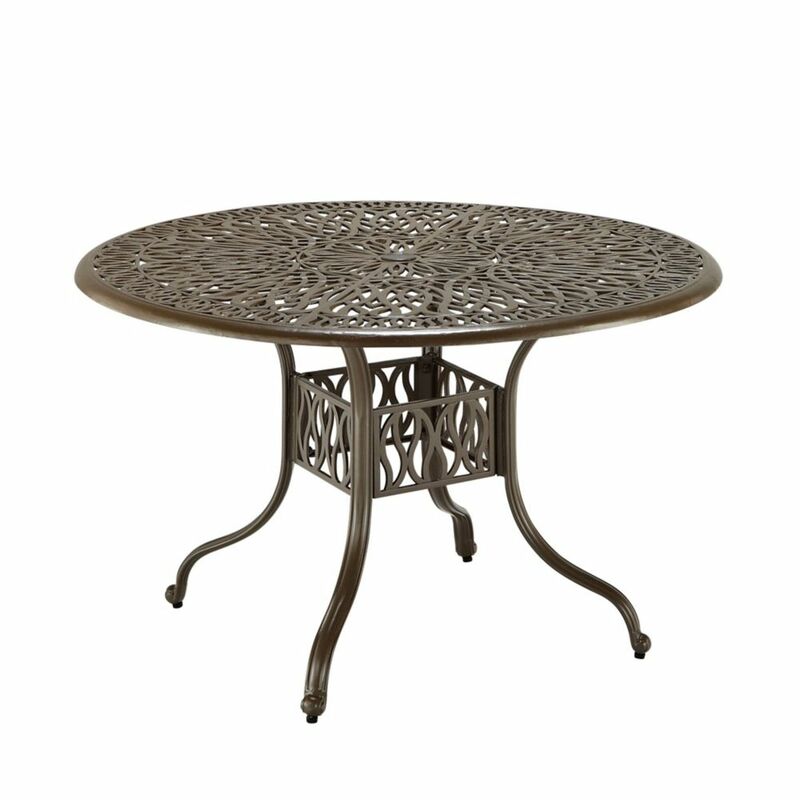 48-inch Patio Dining Table in Taupe is rated 4.2 out of 5 by 11. Rated 5 out of 5 by BarbinBuffalo2 from The table arrived early, was well packaged and in excellent... The table arrived early, was well packaged and in excellent condition. All the hardware for assembly was present and the assembly was straight forward. I'm very happy with the table and it is good value for money. Rated 4 out of 5 by Cindy from The table is great, love the color. I was tired of the black and brown medals and wanted somethi... The table is great, love the color. I was tired of the black and brown medals and wanted something light for our new home in California. It was easy to put together, and a perfect size for our patio. Rated 4 out of 5 by Nadine from It’s a fantastic table. My husband had no problems... It’s a fantastic table. My husband had no problems putting it together. Rated 4 out of 5 by MaryAnn from The reason I didn't give it an excellent rating is... The reason I didn't give it an excellent rating is that the holes and bolts didn't match up and I had to get out a dremel to increase the size of the holes in order to attach the legs to the base. Other than that, I hope it last for years in the salt air as some of my other powder coated aluminum has!